I seem to be on a bit of a roll, but I am sure it won’t last. As you know, in my last order, I got the lovely Stampin’ Up! Scalloped Tag Top Punch, which I have completely fallen in love with. It is designed for making gift tags, and I will use it for that, but there are other uses for it. 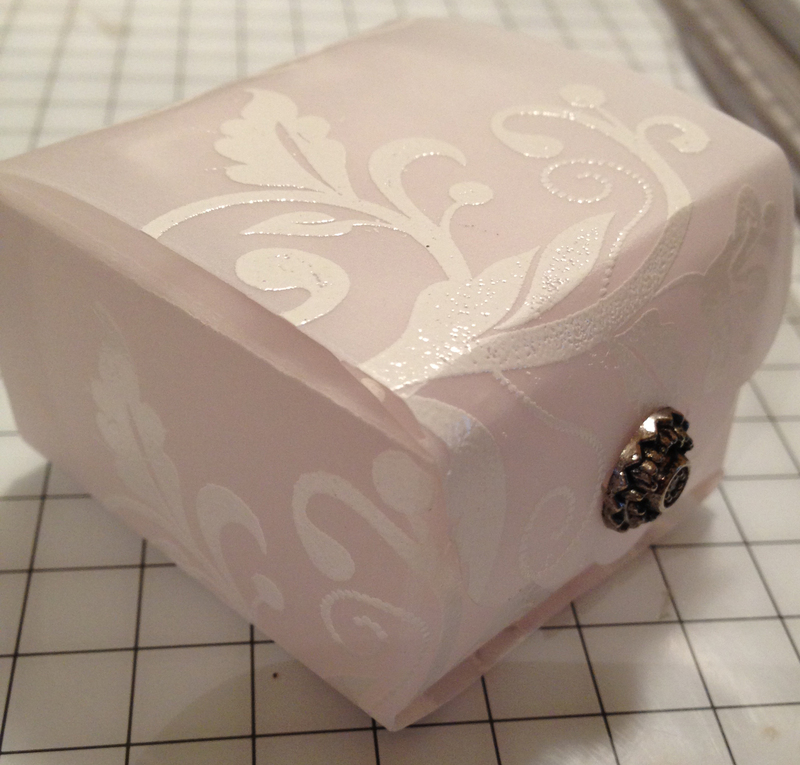 With Easter on its way, I thought that it would be nice to make a little gift box to put a few chocolates in, or perhaps a single small egg (not the tiny ones that are gone before you blink) and I thought that vellum would be a good medium to use. Vellum is tougher than it looks, so will happily hold an egg, assuming I have not eaten it before I pop it into the box. The box is a simple construction, and fastens with one of the gorgeous antique brads, which just fit in the hole that the punch leaves. It is a snug fit, so you may want to leave the bottom of the box unglued and pop the contents in there to keep it looking pristine. The question was how to decorate it. Someone mentioned stamping it, which naturally led me to heat emboss using the beautiful Flowering Fluorishes stamp set and some white embossing powder. I love it! A word of advice when using vellum – don’t press too hard when scoring as it could crack. If you have any questions, or want to buy any of the Stampin’ Up! products, please do not hesitate to get in touch.